The Government of India approved the proposal to set up six new Indian Institutes of Management (IIMs) across the country in its Budget 2014-15 presented in the Parliament of India on June 24, 2015. The new IIMs or the 3rd generation of IIMs are IIM Vishakhapatnam (Andhra Pradesh), IIM Bodh Gaya (Bihar), IIM Sirmaur (Himachal Pradesh), IIM Nagpur (Maharashtra), IIM Sambalpur (Odisha) and IIM Amritsar (Punjab). Mentored by IIM Indore, IIM Sambalpur was registered as a Society under Societies Registration Act, XXI of 1860 on August 19, 2015. 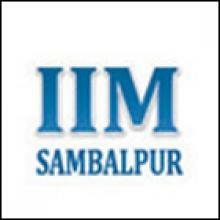 The present campus of IIM Sambalpur has been setup at Silicon Institute of Technology, Sason, Sambalpur, Odisha. IIM Sambalpur has been allotted a piece of land measuring over 237 acres in Basantpur, for the permanent campus by the Government of Odisha. The first batch of Post Graduate Programme(PGP) with 49 students commenced at IIM Sambalpur on September 23, 2015. The Chief Guest of the inauguration ceremony was Shri Sanjay Kumar Das Burma, Hon. Minister, Skill Development & Technical Education and Food Supplies and Consumer Welfare, Government of Odisha. Professor Rishikesha T. Krishnan, Director, IIM Indore and Professor Pawan K. Singh, Faculty, IIM Indore were also present on the occasion. Other dignitaries present on the occasion included Shri L.N. Gupta, Principal Secretary, Skill Development and Technical Education, Government of Odisha; Shri Nagendra Kumar Pradhan, Member of Parliament, Sambalpur; Shri Rohit Kumar Pujari, Deputy Chief Whip, Odisha Legislative Assembly; Dr. Raseswari Panigrahi, MLA, Sambalpur; Shri Ramesh Patua, MLA, Rengali; Shri Balwant Singh, District Collector, Sambalpur; Shri P.C. Panigrahi, Director (Personnel), Mahanadi Coal Fields Limited, Shri Umesh Mishra, Chief Engineer CPWD; Shri Sanjeev Nayakand Dr. P.K. Mishra of Silicon Institute of Technology, Sambalpur. During the mentorship period and while IIM Sambalpur’s own faculty are recruited, faculty members from IIM Indore will be delivering courses at the Institute. This may include a few visiting faculty selected by IIM Indore to meet their standards. The overall design, quality and delivery of PGP will be up to the expected standards and with direct involvement of IIM Indore. The min CAT percentile requirement for shortlisting for next stage has been reduced for OBC -NC,SC,ST,DA categories. The weightage for 10 percentage during the final selection stage has been reduced. Graduation performance has been substituted with CAT performance as a parameter during the final selection process. The weightage for WAT has been increased by 5 percentage points where as weightage for PI has been reduced by 5 percentage points during the final selection process. All the candidates who meet the above mentioned percentiles & who express their interest in joining on IIM Sambalpur's website, will be called to attend the WAT/PI rounds. One point to be noted here is that IIM Sambalpur has shortlisted candidates only on the basis of their CAT performance. This goes on to show that performing well in CAT 2016 would go a long way in securing a WAT/PI call from this premier B-school.